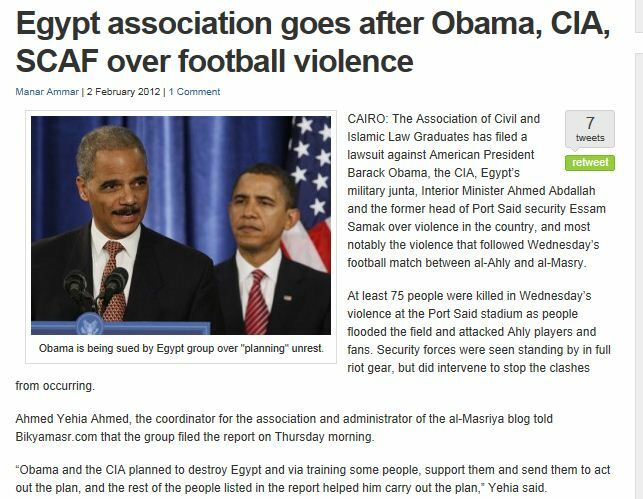 EGYPTIAN ASSOCIATION SUES OBAMA FOR EGYPTIAN FOOTBALL RIOTS……. – The Tundra Tabloids……. EGYPTIAN ASSOCIATION SUES OBAMA FOR EGYPTIAN FOOTBALL RIOTS……. Ok, this can’t be dumped in his lap. Previous Post Previous Post GERMANY’S P.I. : THE WORLD’S MOST DANGEROUS BOOK……. Next Post Next Post ANTI-ISRAELI PHOTO PROVEN TO BE FAKE……. Well, they are arabs, nothing new. And soon they will tell us it was the jews. Forget Egypt. Let the muslims kill eachother there too. Who cares. Well, they have to have somebody to blame for their own behavior. They know incompetence when they see it. Leave our Incompetent-One-In-Chief alone and deal with your own problems. You wanted it, you got it.